4.75 inches of half-serrated drop-point blade for quick, clean cuts. Full-tang, Stainless steel construction for durability. Ergonomic, non-slip rubber grip for comfortable, accurate handling. Lanyard includes a loud emergency whistle. Military-grade, mildew resistant nylon sheath. 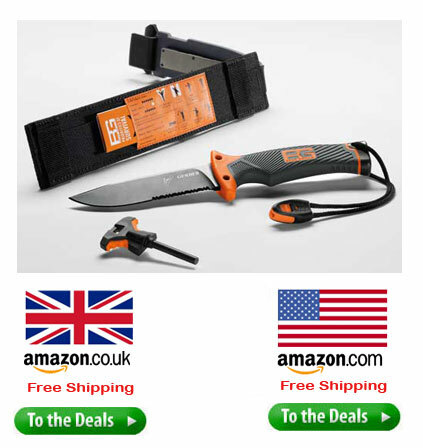 Sheath includes fire starter and diamond blade sharpener. Built to offer the versatility that adventurers, backpackers, and hunters need in the wilderness, the Ultimate Knife features a versatile 4.75 inch drop-point blade. This blade is half serrated to make quick work of cutting rope and other fibrous materials. It features full-tang construction for overall durability, and it is crafted from hard stainless steel, which allows for excellent edge retention. Survival tools are only useful if they're easy to handle, so this knife features a comfortable, rubberized grip that's textured to prevent slippage. And because being a true survivor means making innovative use of your tools, the knife's handle features two holes for securely lashing it to a stick for use as a fishing spear--or whatever other bladed tool your situation calls for. In addition, the handle base features a stainless steel pommel that can be used for pounding or hammering. A lanyard cord helps you keep track of the knife, and the lanyard features an integrated emergency whistle that can be used to attract attention--so others can keep track of you. Balanced for optimum handling, this Gerber Bear Grylls Survival Series Knife has an overall length of 10 inches and weighs just 11.2 ounces-14.72 ounces with the included sheath. Bringing together the 70 years of expertise behind all Gerber Legendary Blades and the survival and adventure experience of the renowned Bear Grylls, the Bear Grylls Survival Series is a one-of-a-kind line of knives, tools, and gear. A former member of the British SAS, a prolific adventurer, and the daring host of Discovery Channel's Man vs. Wild, Bear Grylls is no stranger to extreme situations. 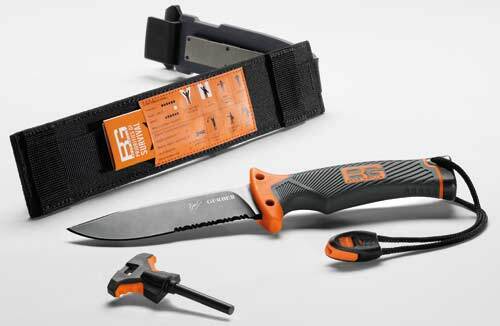 Each item in the Survival Series is thoughtfully designed by Bear and Gerber to offer features that can help keep a smart adventurer alive in the wild. These dependable tools come with Bear's "Priorities of Survival" pocket guide, so you can check your instincts against his experience-based advice. A handy read to keep in your survivor trousers pocket.